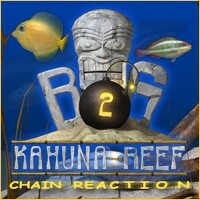 Go Hawaiian all over again with Big Kahuna Reef 2: Chain Reaction! This spectacular and explosively charged match-game of adventure will captivate you as you dive with Humpback Whales, discovering new and exotic fish at every turn. Creative designers from around the world deliver over 750 delightful and fantastical levels! With its breathtaking effects, dynamic explosions and thousands of new levels to download online, what are you waiting for? Come back to an underwater paradise!